Recently, I was on line at the supermarket. While waiting, I couldn’t help but notice the shopping cart of the man in front of me. His cart was full of items that I used to eat and drink. Earlier in my life, I thought my eating habits were excellent. In reality, I was consuming many products that sounded healthy but that were actually full of added sugar and artificial, unhealthy ingredients. Chances are that you are doing the same, no matter how strong you might think your eating habits are. Billions of dollars are spent each year by companies who want you to believe that their products are better for you than they really are. Unfortunately, many people (including my old self) allow food marketers to manipulate them and influence their eating decisions. In this article, you’ll learn about five supposedly healthy foods that can actually make you weaker, unhealthier, and fatter. How often are you consuming these products? Protein keeps you fuller longer and helps you preserve and build muscle. That is obviously good. 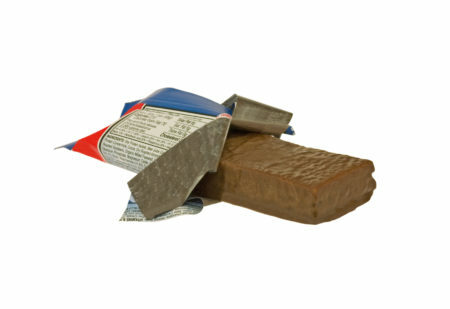 As a result, many people turn to protein bars and drinks as portable snacks that requires no prep time or refrigeration. Unfortunately, most of these bars and drinks are full of artificial ingredients and added sugar. For example, Gatorade makes a whey protein bar with more sugar and a longer list of ingredients than a Snickers bar. As for protein drinks, making your own is much better than buying the ones that you will find in stores. Use water or 100% coconut water for your liquid, use unflavored whey protein powder (or vegan protein powder if you are a vegan) for your protein, and use natural ingredients like fresh fruit for added flavor and nutrients. Yogurt can be an excellent source of protein, and it can also provide key micronutrients like calcium, potassium and magnesium. However, many yogurts at the supermarket actually contain as much sugar as candy and less protein than two egg whites. For example, Dannon and Yoplait each make yogurts with less than 7 grams of protein and more than 20 grams of sugar. If you choose to eat yogurt, a healthier, higher-protein option is Greek yogurt that is organic, nonfat, and plain. You can add fresh fruit like berries for extra sweetness. This one can actually be the most dangerous of all. It’s really easy to turn a salad into a gut-busting, energy-draining meal. If you add in bacon, cheese, tortilla chips, croutons, and/or a creamy dressing, your salad could easily contain well over 1,000 calories. Two such examples include the Caesar Salad offered at Cheesecake Factory and the Chicken and Spinach Salad offered at IHOP. When you eat salads, stick to natural dressings (i.e. olive oil, vinegar, and/or juice from a lemon or lime) and beware of what you add to your greens. Most people realize that regular soda and diet soda are unhealthy. However, many sports drinks and energy drinks contain as much sugar and as many artificial additives as soda. For example, a 20-ounce VitaminWater contains over 30 grams of sugar, which is about the same amount of sugar found in 10 ounces of soda. “SugarWater” would be a more accurate name for this misleading drink. Note: Did you know that VitaminWater and Powerade are manufactured by The Coca-Cola Company and Gatorade is manufactured by PepsiCo? When you drink enough water, fuel yourself properly, and get enough sleep, there is no need for a “sports drink” or an “energy drink” during the day or during exercise lasting less than 45-60 minutes. Either way, a healthier option during or after a tough workout is 100 percent coconut water. This is a catch-all category that I use to refer to any food that is free of something that is supposedly bad for you. This includes items that are “fat-free” or “sugar-free” or “gluten-free.” Beware of packaged foods that advertise what they are free of. There are gluten-free cookies, sugar-free candies, and fat-free ice creams. How do manufacturers make those products taste good without the gluten, sugar, and fat? They usually add artificial sugar substitutes and other unhealthy ingredients to enhance taste and shelf life.